Recently I was at the grocery store, and this know-it-all sign reminded me of a blog post I wrote for the Farm Cooking School back in 2014. At the time, I was designing their kitchen garden and holding gardening workshops at their cooking school in New Jersey. An avocado may be a berry, but not in a way that anyone cares about in their normal lives. Same with a tomato, a cucumber, and any other food that someone wants to tell you “is actually a fruit.” To say this is to confusedly blur the lines between culture and botany. This seemed like a perfect throwback to start things out with! Last Friday I arrived just as the class was sitting down to lunch. They had been learning about roasting, and the first dish I saw was their salad of fresh lettuce, roasted beets , oranges, and pistachios. This salad embodied an idea I've had on my mind for a while: these things that we eat are plants. The terms fruit and vegetable are to plants as beef and pork are to cows and pigs: they refer to a food product and distance us from the source of our food. Just like various cuts of meat, we eat all different parts of plants in general, and different species or families plants are prized for specific parts. We do use some terms in relationship to food that are similar to botanical terms, but the usage is often imprecise, or diverges from the botanical meaning. Let's take a look at this salad. In fact, fruit is a botanical term, but its culinary meaning is different. Haven't you ever had someone tell you that a tomato is actually a fruit? Whether it's a fruit or a vegetable just depends on which glossary you consult. A culinary fruit is generally a sweet or sour, fleshy part of a plant and is usually edible raw. A botanical fruit is a mature ovary or ovaries from a flowering plant along with accessory tissue, and is intended to disseminate the seeds: the seeds and the stuff that go with them. This botanical definition covers the foods we think of as fruits, such as apples, grapes and strawberries, but also includes many that we don't think of as fruits, such as cucumbers, squash, beans, and peppers. If you consider the latter, they all contain seeds and are surrounded by some succulent part, but because they are not sweet, they are in a different culinary category. In this salad, the orange is the botanic and culinary fruit. Only the juicy vesicles of the orange have been used, excluding the hard and bitter peel (endocarp and mesocarp) and the seeds. The bulk of the salad is composed of leaves, a.k.a. lettuce. Many of our green vegetables are leaves, including kale, mizuna, spinach, cabbage, chard, bok choi, as well as many herbs such as sage, parsley, thyme, oregano, and rosemary. The leaves of beets, turnips, radishes, broccoli, and carrots are also edible and delicious, but often ignored in favor of more prominent parts of those plants. Leaves are the main photosynthesizers of a plant and they appear green because of the chloroplast structures responsible for the job. A leaf is a more intuitively obvious than a fruit, having just two large-scale features: the stalk (petiole) and the blade (lamia). Chefs become botanists when they differentiate these structures, as in destemming kale, or cooking with rhubarb, of which we use only the stem, or petiole. This is how rhubarb generally comes to us, though you can see the remains of the leaves at the end of the stalks. Rhubarb leaves are impressively large! Anyone who has harvested a beet knows that it is a root. Like a carrot or a turnip, a beet is a taproot. A taproot, in contrast to a fibrous system, is a central dominant root that develops early and is responsible for storage of sugars and water. In addition to allowing access to soil water and nutrients, being under ground protects these structures from herbivory, or being eaten by animals, and protects perennial structure that allow the plant to re-sprout after periods of adversity, such as winter. For these reasons, we find lots of plant parts underground in addition to roots, including onions and potatoes, which are not true roots. To top off the salad, there are crushed pistachios. A pistachio is a culinary nut, but a botanical seed. A botanical nut is a subset of fruit, which has hard, dry outer tissues, contains a seed, and does not split open on its own. The A seed is an ovule that has been fertilized by pollination and developed in the ovary to become an embryonic plant. It is often surrounded by a variety of protective or dispersal tissues, such as shells, husks, and fruits, but these are not part of the seed itself. There are often nutrients accompanying the embryos in the forms of oils, starches, and proteins, which is why we appreciate seeds so much as food. 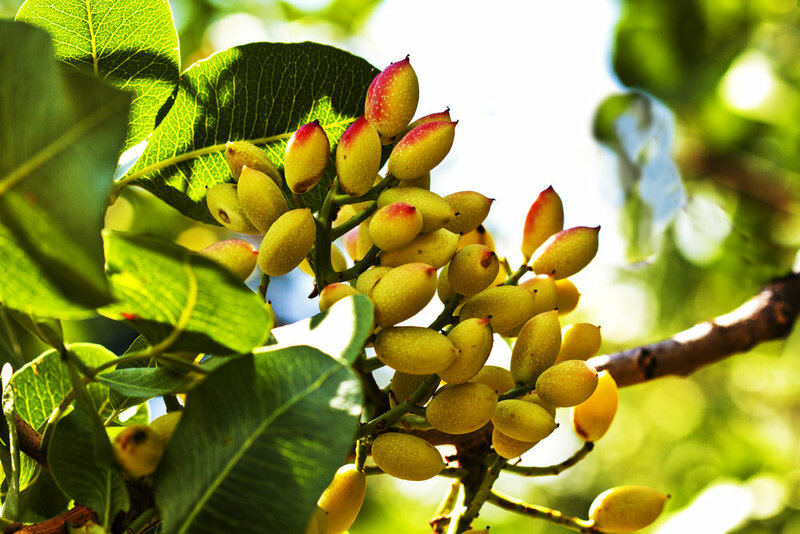 Though we never see it this way, the pistachio grows inside of a fleshy fruit that can be eaten and dispersed by animals. Inside the fruit, the seed is protected by a hard shell to prevent it from being digested when eaten by animals, which is how it comes to us. In order to release the seed for germination, the shell splits open in its characteristic fashion. So the pistachio does not fit the description of the botanical nut, and is in fact, a drupe. Lastly there is the dressing on the salad, balsamic vinegar and olive oil. The vinegar is a fermented grape juice. Olive oil is pressed from the olive fruit. This simple salad is is in fact a marvel, including all parts of a plant. There are roots, leaves, fruits, seeds. Some elements are cooked, some are raw. Some elements are fruit extracts that have undergone additional biochemical processes. Our plate is a study in botany, and what we find there is surprisingly diverse and complex. We have explored, opened, and nibbled so many plants to arrive at meals that we now take for granted as simple pleasures. There is probably a whole world of plant parts still to try.